The Wheel of Wisdom is a new divination tool created by Orna Ben-Shoshan, the artist who brought us the 72 Names Cards and King Solomon Oracle Cards. The Wheel, measuring approximately 10" in diameter, is comprised of two sturdy, shiny pieces of circular cardboard connected in the center by a metal brad fastener. "The front side of the wheel (The sun mandala) is inspired by ancient karma scripts and gives you 96 answers with clear forecasts to how things are going to evolve. The reverse side of the wheel (the decorative mandala) contains 36 Angels' Advice that will fortify you with an additional viewpoint on your question and provide additional guidance." The premise of the Wheel is that you focus on a question, and turn the board around with your hand. There is a small hole on the top circle, which serves as a window to reveal numbers from the bottom board. Once you have landed on a number, you consult the booklet for your message. The advantage here is that one need not study any system for answers. It's as easy as spinning a wheel and looking up the answers. 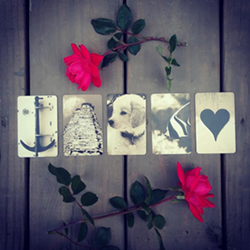 Anyone can use it, and it can be approached by someone of any age, with no divinatory experience necessary. 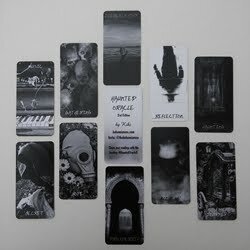 The artwork is top quality, what you would expect from the artist. Vibrant, clear, colorful, surreal artwork adorns the front side. The back is more muted, with lovely floral patterns. The numbers revealed on the front are just numbers. But the hole on the back is larger, and along with the Angel numbers, there is also the image of a different Angel's head peeking out with each number, with both male and female represented. 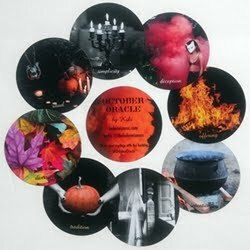 I have had mixed results with the readings I have done for myself with the wheel. More often than I have received accurate, relevant answers, I have received answers that make no sense to my question. To start off, about 95% of the time, I will stop on a space halfway between two numbers. And I never know whether I should nudge it a little to the left, or a little to the right. Many times I will just read both numbers, but as they are frequently completely different responses, it does me no good. There was a time I asked about letting go of something, and landed squarely on a number. The corresponding passage mentioned "release", so it was definitely relevant. But again, expanding that reading with an Angel message from the back side of the wheel, the passage had nothing to do with the situation. More often than not, I have found that even when I finally do get to a number, the message is irrelevant to my query. The booklet states many reasons for receiving confused answers. Firstly, it's written that you should only consult the wheel when you have a "crucial pressing question". I have bypassed this stipulation because I wanted to use and review the Wheel, but I haven't had many crucial pressing questions to ask it. Another reason given for not receiving relevant answers is not relaxing and focusing properly before asking questions. (Guilty!) Or that the future simply does not wish to reveal itself. So maybe I have just not been focused enough to use the Wheel with much success. Or maybe it's the reality that not every tool will be a match for every reader. 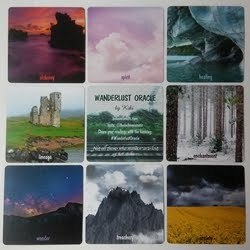 If you are a fan of Orna's artwork, as I am, it is a lovely addition to one's divinatory library. I think I will return to it again in the future, maybe saving it only for those times when I have something of great importance to ask. Perhaps it is meant for me to truly use it for angelic help when absolutely needed. 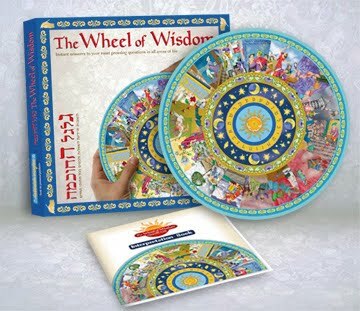 Visit Orna Ben-Shoshan's website for more details and ordering information on the Wheel of Wisdom. 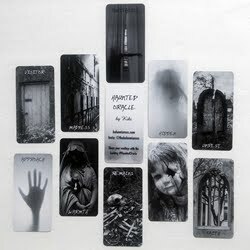 This oracle review was originally published on my previous blog (Tarot Dame) on 6/17/11.